PACLOCK’s 90A Padlock is light weight and versatile; precision CNC machined in the USA for quality and dependability; and comes standard with a 6-pin bump and pick resistant rekeyable cylinder. The solid body 90A is machined from 6061 aircraft-grade aluminum, anodized in one of ten available colors, resistant to corrosive environments, and ideal for marine applications. The 90A is available in several keying options and features a non-key retaining brass actuator and dual locking stainless steel ball bearings. With our design, PACLOCK significantly reduces the ability for the lock to be shimmed and pulled. PACLOCK provides a key retaining option to ensure your padlock gets locked. PACLOCK’s 100A Padlock offers superior security; is precision CNC machined in the USA for quality and dependability; and comes standard with a 6-pin bump and pick resistant rekeyable cylinder. The solid body 100A is machined from 6061 aircraft-grade aluminum, anodized in one of ten available colors, resistant to corrosive environments, and ideal for marine applications. The 100A is available in several keying options and features a non-key retaining brass actuator and dual locking stainless steel ball bearings. With our design, PACLOCK significantly reduces the ability for the lock to be shimmed and pulled. PACLOCK provides a key retaining option to ensure your padlock gets locked. The 100A comes standard with a 1-3/16” hardened steel shackle. With PACLOCK’s quick change shackles, you can easily adapt your padlock to any application with just a turn of a wrench. Change the shackle height or type to meet your needs. Take advantage of PACLOCK’s multiple shackle options. PACLOCK’s 100A-IC SFIC Padlock offers superior security; is precision CNC machined in the USA for quality and dependability; and works with your 5, 6, and 7 pin small format interchangeable cores. The solid body 100A-IC is machined from 6061 aircraft-grade aluminum, anodized in one of ten available colors, resistant to corrosive environments, and ideal for marine applications. The 100A-IC comes ready to install any SFIC cylinder and features a non-key retaining brass actuator and dual locking stainless steel ball bearings. With our design, PACLOCK significantly reduces the ability for the lock to be shimmed and pulled. 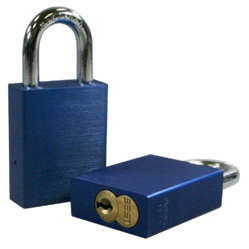 PACLOCK provides a key retaining option to ensure your padlock gets locked. The 100A-IC comes standard with a 1-3/16” hardened steel shackle. With PACLOCK’s quick change shackles, you can easily adapt your padlock to any application with just a turn of a wrench. Change the shackle height or type to meet your needs. 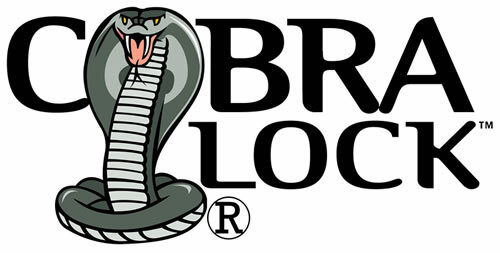 Take advantage of PACLOCK’s multiple shackle options. 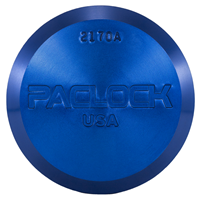 PACLOCK’s 2170A Hockey Puck-Style Padlock offers superior security; is precision CNC machined in the USA for quality and dependability; and comes standard with a 6-pin bump and pick resistant rekeyable cylinder. The 2170A has a flat-back without holes to fit shrouded Hasps, including PACLOCK’s 1/4” steel PL770 and PL775. The solid body 2170A is machined from 6061 aircraft-grade aluminum, anodized in one of ten available colors, and resistant to corrosive environments. The 2170A’s hidden shackle design protects your lock from direct access by bolt cutters and hacksaws. 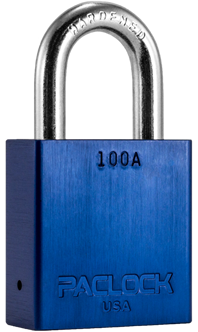 With only one moving part, the 2170A lacks the environmental vulnerabilities that traditional, shackled padlocks have. Even after years of exposure to the elements, this lock will still function. PACLOCK’s TL81A offers superior transportation security; is precision CNC machined in the USA for quality and dependability; and comes standard with a 6-pin bump and pick resistant rekeyable cylinder. The TL81A is the only hidden shackle trailer lock made in the U.S. and fits swing door truck trailers, refer trailers, toy haulers, car trailers, horse trailers, & equipment trailers (does not fit intermodal containers). The solid body TL81A is machined from 6061 aircraft-grade aluminum, anodized in PACLOCK blue, and resistant to corrosive environments. The TL81A’s hidden shackle design protects your lock from direct access by bolt cutters and hacksaws. 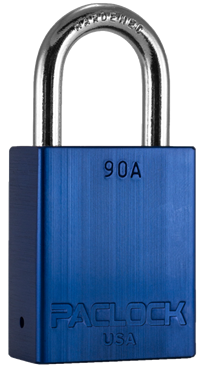 With only one moving part, the TL81A lacks the environmental vulnerabilities that traditional, shackled padlocks have. The TL81A also comes equipped with the PAC-BAND, a rubber cover to protect the cylinder from dirt and grime. PACLOCK’s JOB-BOX-LOCK is the only padlock engineered specifically for securing job boxes and tool chests, including Knaack® and Rigid®. Light weight and versatile, the JOB-BOX-LOCK is precision CNC machined in the USA for quality and dependability and comes standard with a 6-pin bump and pick resistant rekeyable cylinder. 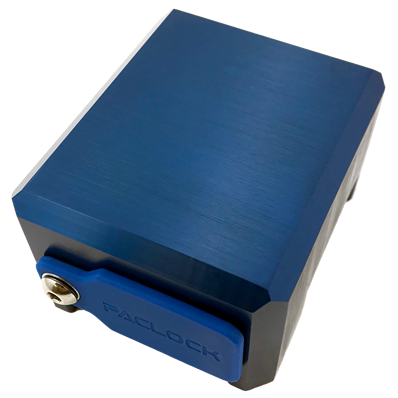 The solid body is machined from 6061 aircraft-grade aluminum, anodized in PACLOCK blue, resistant to corrosive environments, and ideal for outdoor applications. The JOB-BOX-LOCK is available in several keying options and features a non-key retaining brass actuator and dual locking stainless steel ball bearings. With our design, PACLOCK significantly reduces the ability for the lock to be shimmed and pulled. PACLOCK provides a key retaining option to ensure your padlock gets locked. 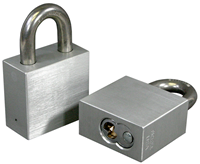 The JOB-BOX-LOCK comes standard with a 3/8” diameter, 1” tall stainless steel shackle.